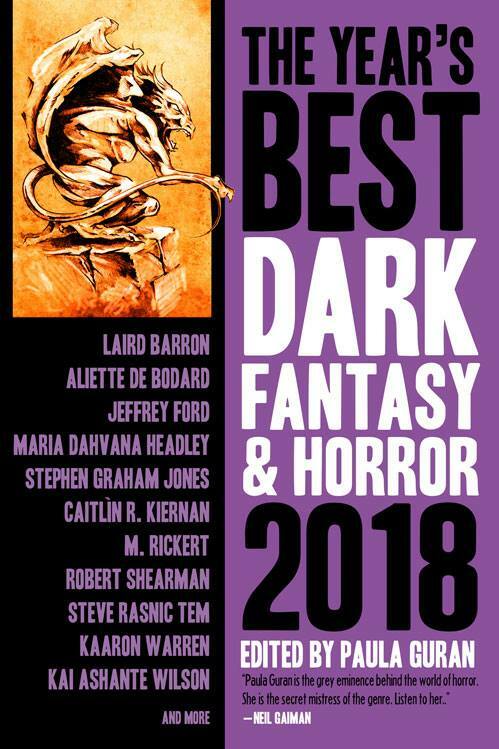 A little while ago, Paula Guran announced the table of contents for the Year’s Best Dark Fantasy & Horror 2018 anthology that she has edited for Prime Books and I’m so stoked that she has included my story ‘Little Digs’, which originally appeared in The Dark and is also the titular story of my forthcoming collection (out next year, thanks to ChiZine Publications). I love this strange, quiet story and I’m so delighted that Paula does, too! This morning I woke to see that Paula has also revealed the cover for this year’s anthology — so striking! Can’t wait to get my hands on a copy of this beauty. Tags: anthology, chizine publications, CZP, little digs, paula guran, prime books, short story, the dark, writing, year's best dark fantasy and horror. Bookmark the permalink. Previous post ← The Five Senses of Horror: Out today!